Look at the teeth. Then look again. The teeth were not attached to the wood. They were carved on the same tree log with meticulous carving detail after the chainsaw had finished the preparation cuts. The Bear : The original photograph in a home setting. 'The Bear with Teeth' is one of the highly sought after chainsaw carvings of Doug Henne. 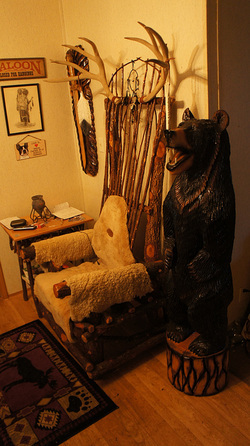 In a personal setting The Bear with Teeth is the guardian of the room. In this home it is facing the outside door. As one person said, "I think I can smell his breath." Whether log cabins, home settings, front porch guards, or restaurants, The Bear with Teeth is a customized favorite. Remember, each carved Sculpture is 'One of a Kind' in its own right. Time frame for an fresh order from a client is approximately 30 days for the chainsaw foundation, the drying room to season the wood, the detail carving work, coloring which can be the tint of your choice and indoor/outdoor protection. Size : The Bear with Teeth height is preferably requested to be four to eight feet. This is an example of an eight foot demonstration cut of The Bear. This one is the closed mouth style after the initial chainsaw carving foundation cut.